Miss Mita Nag, daughter of veteran satirist, Pandit Manilal Nag and grand daughter of Sangeet Acharya (a master musician) Gokul Nag, belongs to the Vishnupur Gharana of Bengal, a school of music nearly 300 years old. In terms of lineage, Mita is the sixth generation sitar player in her family, the tradition having begun with her fore fathers. It was with her grandfather Gokul Nag, who had become the Guru of a noted zamindar (feudal lord) family of Uttarpara, a Northern suburb town of Kolkata, that the music of the Nag family came into limelight. With her illustrious father Manilal, the sitar tradition of Vishnupur gharana was made known to the world. This Gharana follows the Dhrupad style of song and the instrumental recital too, imitates the dhrupad style in the Alap phase. Mita (born,1969) was initiated into music at the tender age of four . She had shown rather early gestures of her love for music. Toddling with her tiny sitar Mita began her early training under the guidance of her mother who was also a disciple of Gokul Nag. Her grandfather’s encouragement and instructions through singing had much influence on her early reception of music, most noticeably, associating the instrument with song. Her tutelage under her father started at the age of six. Mita appeared for her debut performance at the age of ten years, the year 1979 being observed as the International Year of the Child. The same year Mita won the Junior National Talent Search Award of the Govt .of India. 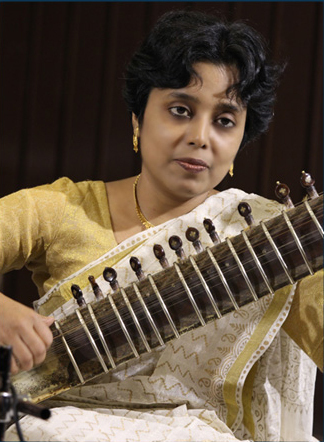 Mita has performed in a number of concerts, solo as well as duet recitals with her father in major cities of India and in many cities of the US, Canada, Japan and Europe. She was awarded the Junior Fellowship Award by the Human Resource Development, Govt of India, for her research project on Vishnupur Gharana. Mita has founded the Gokul Nag Memorial Foundation, a Trust for the promotion of Indian Classical Music, in the fond memory of her grandfather. Mita is a Masters in English Literature and an M.Phil. in English from The University of Kolkata. Doverlane, Golden Jubilee Celebrations with Pandit Subhen Chatterjee on tabla. Besides, the father daughter duo have presented their enthralling recitals in many cities of the country. 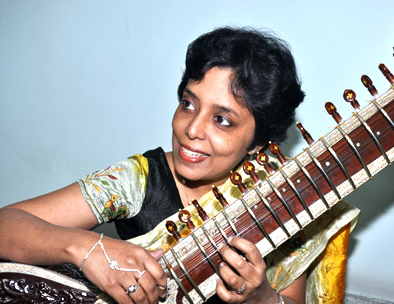 As a soloist Mita has been performing in numerous cities of the country and has participated in famous Sangeet Festivals such as The Doverlane Young Talents, The Doverlane Music Conference, 2013, The Uttarparha Sangeet Chakra Conference 2013, Salt Lake Music Festival ( a number of times), Sangeet Piyasi, Kolkata, Khyal Trust, Dadar Matunga, Swar –Yatra in Mumbai . She has also performed at many cities and towns of Germany, Belgium and Netherlands.